Imhotep has a very simple set of rules. It’s played over 6 rounds where players take one action at a time in turns until all 4 ships have sailed to a site. A player can on his/her turn take only 1 of 4 available actions. A player can place 3 stones of their colour on their supply sled, or move a stone from their supply sled onto a ship (that has an empty spot), or sail a ship to a site (unloads every players stones to that site), or use a blue card (acquired at the market) to do what it says. When you sail a ship to a site you will unload the stones on the ship there. Each site has its own set of rules for how to unload the stones and how they score the owner points. They also score you points at different times. The Obelisk for instance only scores at the end of the game, but there are lots of points to be had if you own the tallest one. The pyramid on the other hand score you points the moment you play a stone there, but different spots have different point values, so here the order of the stones on the ship becomes really important. So players spend their turns trying to get the best out of the current situation. Sometimes you’ll have to fill up you supply sled again, other times you want to get a lot of points by sailing a ship to a certain site, but this might also help the other players, so is it worth it? Or should you just sail a ship that you have no stones on to a site where the players with stones on it will get little to no benefit? Every turn is like this, you have so few and simple actions to choose from but a lot of interesting choices to make. 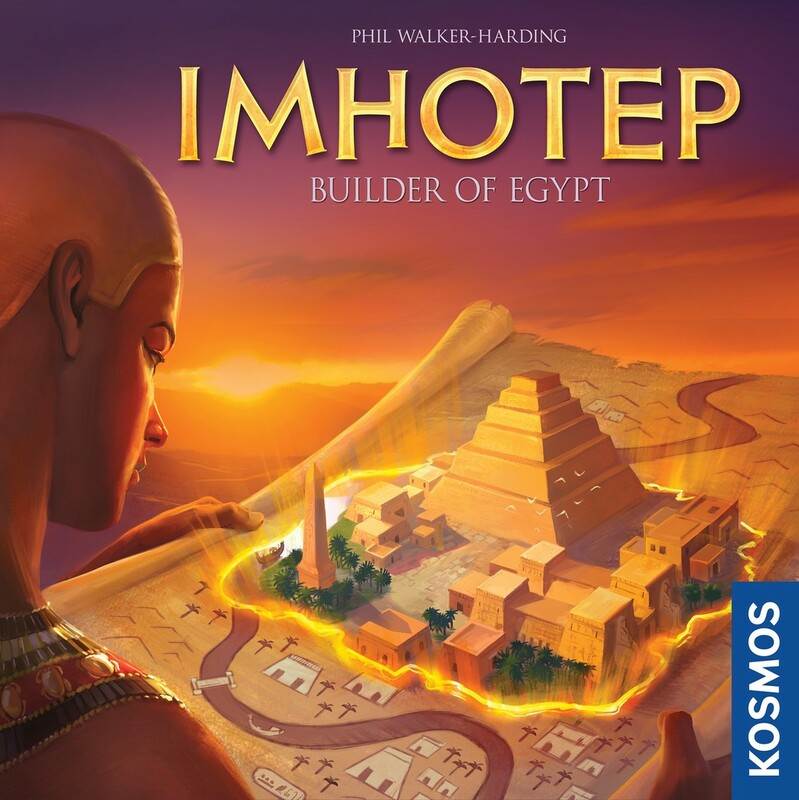 I love Imhotep and everything about it. It’s a clean simple design but it has so many interesting choices to make each turn. It’s a game all about timing and choosing the right action at the right time. It’s highly interactive and you can really affect other people in a very real (and mean) way. It keeps you constantly engaged. You keep an eye on people and what they are trying to do, and when it’s not your turn you pray to the Ra that they wont sail that ship, with your cubes that you have plans for, to the wrong spot. The game length is perfect, it’s not too quick and it doesn’t outstay it’s welcome. After every game I’ve felt compelled to play it again. Also worth mentioning is the alternate sides of all the sites, that adds to the replayability of this wonderful gem of a game. The rules for the game are so simply, and is a quick read (with lots of good examples too). Thanks for the quick review. I’ve been thinking about getting this game and you’ve given me reason to do it. I’m eager to try it out too! So the Spiel des Jahres nomination is well worth it in your opinion? I think it is. I would play it any day over Codenames. Not that I think Codenames is a bad game, I actually like it quite a bit too.